Meridian collaborates on Sir George Martin Signature Custom headphones | What Hi-Fi? Meridian Audio, Advanced Communication Solutions (ACS) and fashion house Asprey, have come together to produce a limited run of bespoke in-ear monitors complete with DAC and presentation box, endorsed by Beatles producer, Sir George Martin. The in-ear monitors are being made to increase awareness of noise-damaged hearing loss, an issue close to Sir George's heart, and to raise money for the UK's largest hearing loss charity, Action for Hearing Loss. ACS has taken care of the earphones, Asprey has designed the hand-crafted presentation box and Meridian Audio supplies a £199 Explorer 2 DAC with every set of headphones. Only 1000 units will be available and £250 of the £2250 asking price will go to the Action for Hearing Loss charity. The earphones themselves feature a three-way crossover for three “perfectly balanced” miniature speakers: a larger driver to take care of low frequencies, a mid-range driver and a tweeter for high frequencies. 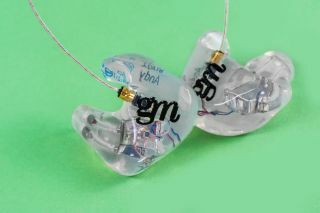 This is all housed within ACS’s proprietary silicone custom ear mould. The cable is also provided by ACS, in the form of its new Linum cable. It’s designed by Danish micro cable specialist Estron and made from silver plated copper with an enamel coating. It’s claimed to ensure “no coloration of the sound and an extremely reliable connection”. Each pair of earphones comes with a hearing dose management unit, HDMPro, which is designed to keep the output within the limits set by the EU's 'noise at work' legislation. British drummer Gilson Lavis, formally of the band Squeeze, was commissioned to paint Sir George's portrait, and a signed and numbered print is also included. Want to get your hands on one of the 1000 pairs of George Martin Signature Series headphones? To register your interest, head to the ACS website.